The high-standard, well-equipped and spacious apartments have just been renovated and are in use throughout the year. There are seven cosy apartments providing accommodation for 14 guests. The apartments are either located in the main building or nearby and each apartment has its own entrance and small decking area. 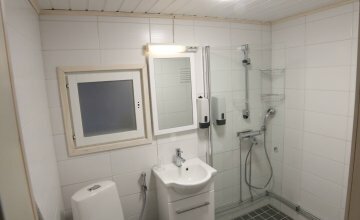 Cosy apartment for 1–2 persons located in the main building. This two-person apartment has one bedroom and a spacious kitchen-lounge. Cabin-style apartment for 1–2 persons. Semi-detached building.